Lantern in Slutsk: what would have Alexander Blok signed for? Главная > Новости > Lantern in Slutsk: what would have Alexander Blok signed for? In translation of the life`s prose, the problem is in unlightened stairs on the left side of the shop «Supermarket» (Lenina Str, 237). We started to collect signatures. As you know, darkness is «friend» of youth. And if today, on St.Valentine’s Day, we can all understand and smile, then with the beginning of working days, we will insist to solve the problem in accordance with the social standard №7, which determines the proportion of the illuminated streets of cities and towns. So, all of us are living in a definite street, in a particular house. Naturally, we want to see all around our house functioned properly, complying with sanitary standards and qualitative. Social standards – a guarantee of quality of life. 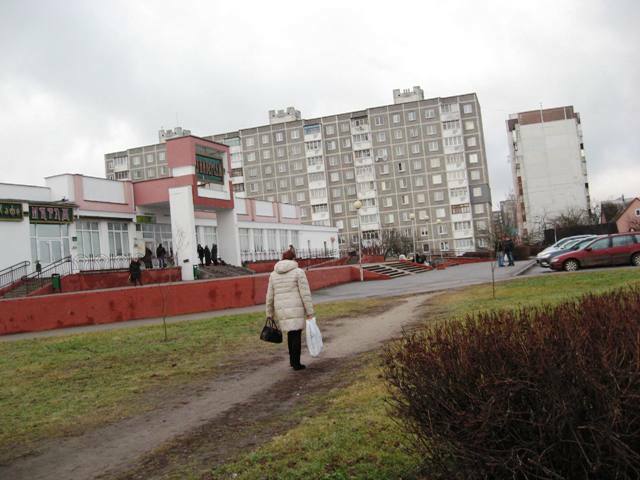 In Belarus there are 43 basic social standards of public service, 12 of them – in the field of housing and communal services. Social Standard №7 – standard to determine the proportion of the illuminated streets of cities and towns. Territories of the social and cultural entities should be well equipped: comfortable tracks, qualitative lawns and flower beds, trees and shrubs, fencing, lighting, benches and other small architectural forms. For increasing the comfort of people`s life, access to social entities should be well lighted. Shop «Supermarket», located on Lenin Street, 237 has some approaches. At the main entrance to the shop is porch, stairs, steps are very well lighted. At dark time of a day, you can safely and comfortably going by stairs into the trading floor of the store. But many buyers of the nearby 9-floors houses is faster and shorter to climb the stairs of the left side, which is not lighted – no outdoor lanterns. There is a big probability to be injured, especially for elderly people. Therefore, the townspeople asked for help of «Our House» to provide outdoor electric lighting of the left side of the stairs. In view of well-being of people, we believe that is possible and necessary to solve this problem. We have already begun collecting signatures for a collective appeal to the administration of the city. PS: We are sure, Blok would signed it too.